Home Brand Marketing Bugs.com – Killer Domain Name! Bugs.com – Killer Domain Name! There are a few interesting things I want to point out. Bugs.com is an awesome domain name – perfect for a pest control company. It is short and super easy to remember. In fact, I remember Bugs.com more than the actual name of the company. The owner of the company is not a called Bugs.com. The company is called Hulett Environmental Services. A Google search for the company shows that their website is found on Bugs.com. They are not using it as an easy to remember forwarder. I don’t see any public sales record for Bugs.com, so I have no idea what the company paid to acquire this great domain name. It looks like the company may have acquired it back in 2003. Bugs.com is a killer domain name and it’s nice to see it being used! Absolutely agree. My thought is it is vastly under utilized–should be a nationwide franchise that could easily compete with the Orkin Man or Terminix. Completely agree, excellent domain, do not use their potential perhaps lack of vision. 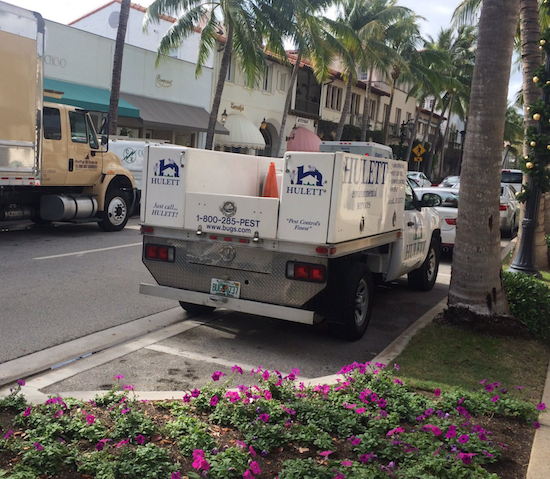 Photo was taken on Worth Avenue (Palm Beach, Florida). Yep, one of the best alright !